It seems more than a little Northfield-esque. 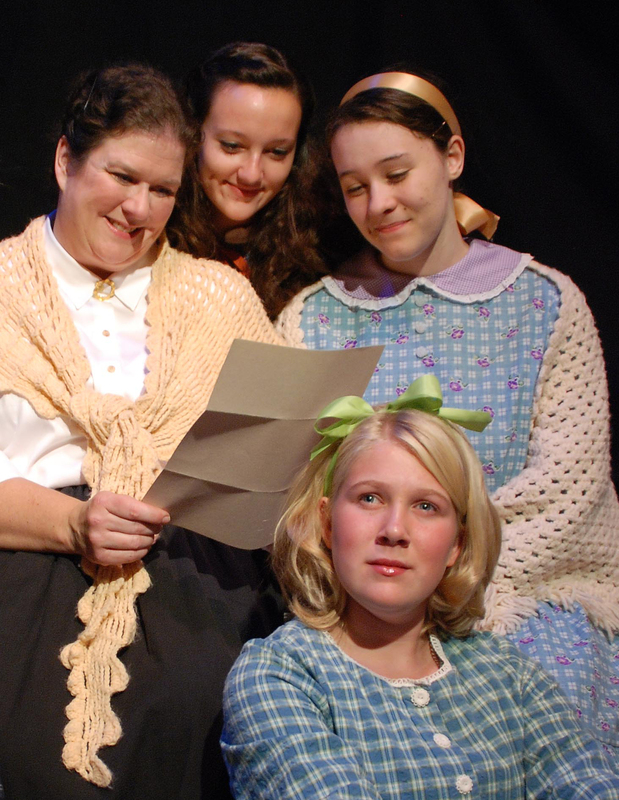 Little Women, set in a New England town, shaped in part by the political and economic forces of the Civil War, filled with abolitionists and transcendentalists, and peopled by educated women and heroic men. Opening Friday night at the Arts Guild Theater. Friday, November 4th: Occasional Jazz and Fang Tango, 5:00 to 8:00 p.m., Contented Cow; Ben Aaron, 7:00 p.m. Hogan Brothers Cafe; West Side Story, 7:30 p.m., Northfield High School Auditorium; Little Women, 7:30 p.m., Northfield Arts Guild Theater; Agnes A Cappella, 7:30 p.m., Lion’s Pause on the St. Olaf College campus; Semaphore Fall Dance Concert, 7:30 p.m., Weitz Center on the Carleton College campus; Marty Anderson and the Goods, 8:00 to 11:30 p.m., Tavern Lounge; Stone Soup, 8:30 p.m. to 12:00 a.m., Contented Cow; Fox & Coyote, 9:00 to 11:00 p.m., 620 Grill; Karaoke, 9:00 p.m., Rueb’N’Stein; and Giraffes Love Dinosaurs, 11:00 p.m. to 1:00 a.m., 620 Grill. Saturday, November 5th: Fresh Space, 2:00 p.m., Dittman Dance Studio on the St. Olaf College campus; Peter Diggins and Friends, 5:00 to 7:00 p.m., Contented Cow; Lars Skjervheim Spelemannslag, 7:00 p.m., Northfield Carnegie Library; Cannon Valley Regional Orchestra, 7:00 p.m., Northfield United Methodist Church; Charlie, Timo, & Ryan, 7:00 p.m., Hogan Brothers; “F” is for Fake, 7:00 p.m., Weitz Center on the Carleton College campus; West Side Story, 7:30 p.m., Northfield High School Auditorium; Little Women, 7:30 p.m., Northfield Arts Guild Theater; Carleton Singers and Carleton Choir: Renaissance Music, 8:00 p.m. Concert Hall on the Carleton College campus; Optimum Trajectory, 8:00 to 11:00 p.m., Contented Cow; Relativity, 8:00 to 11:30 p.m., Tavern Lounge; and D J Music, 9:00 p.m., Rueb’N’Stein. Sunday, November 6th: Cannon Valley Regional Orchestra, 3:00 p.m., St. Ansgar’s Lutheran Church; Choral Day Concert, 4:00p.m., Skoglund Center on the St. Olaf College campus; and Politics and a Pint, 6:00 p.m., Northern Roots Session, 7:00 p.m., and Quiz Night, 8:00 p.m., all at the Contented Cow. Photo courtesy of Tania Legvold.